From 30 March 2018 Angola started issuing tourist visas valid for 30 days in a simplified procedure to visitors from 61 countries. The e-Visa system allows citizens to obtain entry-exit tourist visas on arrival to and from Angola. The first step to apply for a Tourist e-Visa is to fill out an easy online application. Once you have electronically submitted your application, you will receive the confirmation by email. Please take care to answer all questions on the application accurately and completely. Foreign citizens who have received a Tourist Visa in the electronic visa system need to enter Angola through the Luanda Airport. The validity of your visa is 60 days and maximum length of stay is 30 days. What is the Angola Tourist eVisa? The Angola Tourist eVisa is the official travel document needed by foreigners wishing to enter the Republic of Angola, in recreational, sports and cultural visit. What do I need to apply for a Angola Tourist eVisa? What is the cost to obtain a Angola Tourist Visa? The Angola Tourist Visa costs 120 USD. Additionally, there is a service fee of 30 USD for standard processing. For rush processing and super rush processing the service fee is 55 USD and 85 USD, respectively. How long is the Angola Tourist eVisa valid for? It is valid for 60 days after issue. What requirements should my passport meet if I want to apply for a Angola Tourist eVisa? Your travel document has to be valid for at least one year after your eVisa expires and have at least 4 blank pages. I made a mistake on my application. 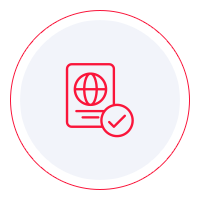 Can I modify the e-Visa after it’s issued? No, we can not change or modify any details on the e-Visa once it's issued. If you do, however, realize you made a mistake before your visa has been issued, then please contact us ASAP via online chat or by sending an email to help@ivisa.com. How long can I stay in Angola with an e-Visa? How many entries are allowed under a Angola Tourist eVisa? The Angola Tourist eVisa allows for multiple entries after 60 days of issued. Can I extend the stay period of the Online Regional Permit? Yes, the Angola Tourist eVisa stay period can be extended 30 days. You need to contact the Angolan diplomatic and consular missions. Can I work under a Angola Tourist eVisa? No, work or any paid activity is prohibited under an Angola Tourist eVisa. Which countries can apply for a Angola Tourist eVisa? Can I enter to Angola through any port of entry? You can enter Angola through the Luanda Airport.